This post is my 250th! Is it fair to say that 250 posts is a body of work? An oeuvre? I think so. Perhaps this is a good time to spring for a Pop Quiz, to see what teachings have been distilled from all these photos and words. HeRE iS thE PoP qUiZ. “Just do your best,” says The Directrice’s mother. Note: Answers to these questions reflect the Directrice’s world order, which is not always aligned with objective reality. Now on to routine business! I love an ivory sweater in the winter. 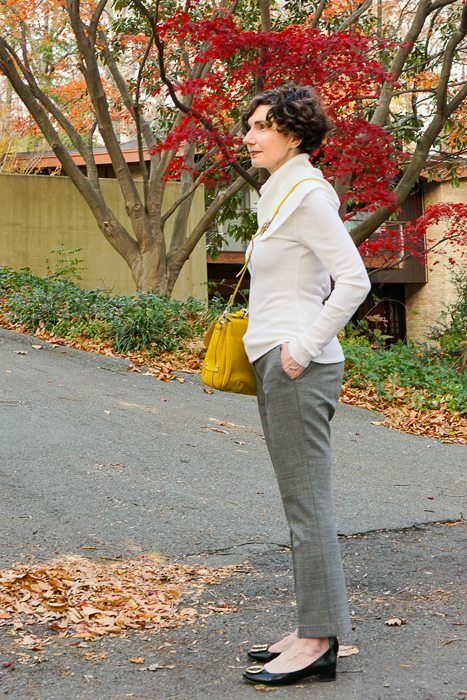 Ivory looks great with grey or black pants and jeans. O.K. The edge of the woods. There is a house behind me . . .
A simple sweater will do the trick, but I had to have this colossal turtleneck. The sweater is enveloping me. Or is it engulfing me? There is something of a nun’s habit in this sweater, isn’t there? While doing a little research into the vocabulary of religious garments, I found a couple of websites specializing in vestments. Even they were having “Black Friday” sales. This cracked me up. Do priests go crazy for bargains on Black Friday? Tell me how to keep whites white, please! 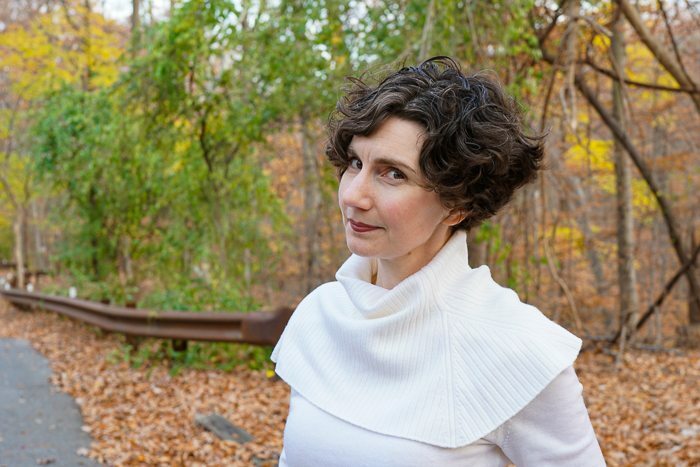 Hi Susan — One of my earliest posts — The Virtues of White Blouses — goes into agonizing detail and a number of readers have offered their own suggestions. One reader (Jessica) suggested using mineral salt deodorant to avoid yellow under-arm stains in the first place. I still need to try this. But what about all the khaki and white pants? I demand a recount. Also, I have been known to remove my white blazer entirely as I prepare, eat, and meticulously wipe down my work area after coffee and lunch and all non-white snacks (pro-tip: banana and almonds is a stain-free snack). Worth it. I scored 8 out of 10, and like Jennifer, demand a recount concerning pants. I’m still pleased with myself and even more pleased that you thought to include a quiz in your post. That was fun! Have you considered writing about your beauty-related routines and interests? I’m interested and bet I’m not alone. My beauty routine wouldn’t fill a mouse’s tea cup, Rebekah — but I will put together a post describing it this month. I am running low on ideas! I’m also open to posts about mice and their teacups. I got 9 out of 10! Thought pants could be any solid color. You’ve taught us well Directrice! 7 out of 10 — but I think I decided to throw in my own views on white blouses and a couple of other things! I scored 8 out of 10 and understand about the pants. Fun quiz! 7 out of 10, couldn’t help going with my own views on white blouses (which I considered a trick question) & bustiers. I followed The Directrice’s views on black and grey pants to score more highly (do we ever stop trying to ace tests? ), but I strongly disagree on that one, and second those who pointed out the Directrice’s own advocacy of white and khaki pants. (Plus I wear summer pants in bright solid colors and prints; I live in NY and need a break from black). Hello Lynne — I should take this moment to tell everyone that I like colored pants and admire patterned pants (which one of my colleagues calls “fancy pants.” I just don’t think I have the moxie to pull them off! yeah! 8 of 10, and it might have been better if I hadn’t indulged my interest in game theory. 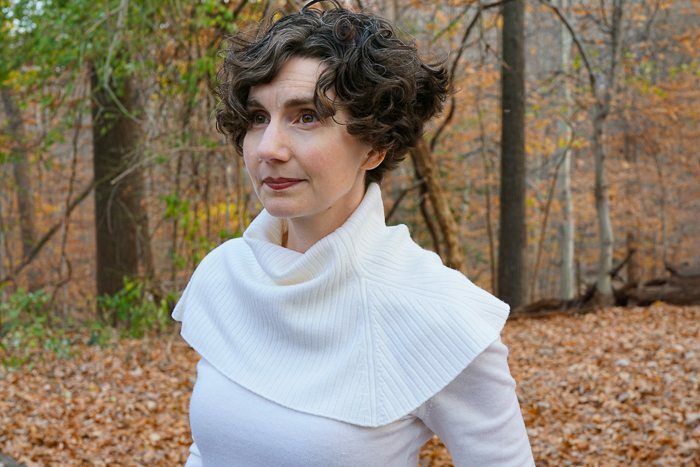 The cowl neck looks lovely on you. Congratulations on 250 posts and thank you for inspiring and entertaining us! I have to agree that the post on “hard” pants lends support to the argument that the pants answer is questionable. As an educator, I love a quiz! Good job Directrice! I would have gotten a perfect 10, but I don’t believe you can keep a white shirt white. Plus, I really wanted to know what one hand clapping sounds like. I scored 10/10. Clearly, I have been paying attention!! Your blog is so enjoyable!! Yay, 10/10 here too. Looking forward to the next 250! Khaki is not grey or black! Neither are ivory pants, which I think you’ve worn. And I insist white shirts cannot be kept perfectly white, no matter what bleach-salt trickery-pokery you try. In fact, I’d say the second law of thermodynamics applies for white clothing more than anything else in the universe. Nonetheless, I enjoyed the quiz, thank you! Trickery-pokery is making me laugh, Alexa. And you are right on all counts. The quiz is cruel!